Budget Hotels in Udaipur, Hotel in Udaipur near bus stand and railway station, Cheap Udaipur Hotels with tariff. Padmini Palace is among best Budget Hotels in Udaipur. Padmini Palace is housed in a four-storey building. Well appointed and conveniently located in the heart of the city near the famous Gulab Bagh garden, with just 5 mins walking distance from the famous lake pichola and city palace and just a stone throw away from the prominent shopping places. It is ideal for a comfortable stay, both for leisure as well as business travelers. It is also near to railway station and bus stand. The bus stand is only 0.5km, the railway station is 1 km and the airport is 21 km away from the hotel. Hotel is a captivating leisure destination in itself, offering a myriad of services and facilities to experience our truly enriching surroundings. If you are planning a visit to the city of lakes then it is one of the most prominent hotel in Udaipur for your stay. 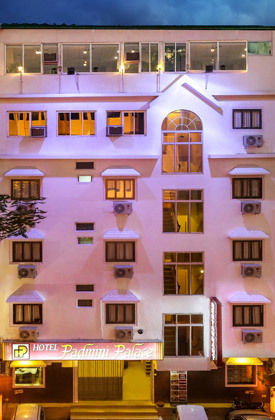 The hotel offers 20 elegantly appointed rooms gracefully decorated and furnished with all modern amenities categorized into Royal family suite, Super Deluxe, Deluxe and Standard. All the rooms are very colorful and bright. Padmini Palace offers “Padmini Restaurant” the a/c restaurant that serves multi cuisine fares with a panoramic view of city palace and aravalli hills. To pamper the guests with ultimate comfort, luxury and pleasure the hotel offers multifarious amenities and services like room service, satellite T.V, running hot and cold water in shower, direct dial from rooms, mini-bar, same day laundry service, conference hall, power backup, lift to all floors, travel desk, Car rental, sightseeing arrangements, car parking, credit card payment, currency exchange, flower arrangement, cake and cookies and doctor on call. The ideal location and warm hospitality makes it a widely accepted hotel by all types of travelers who visit the city of lakes “UADAIPUR”.